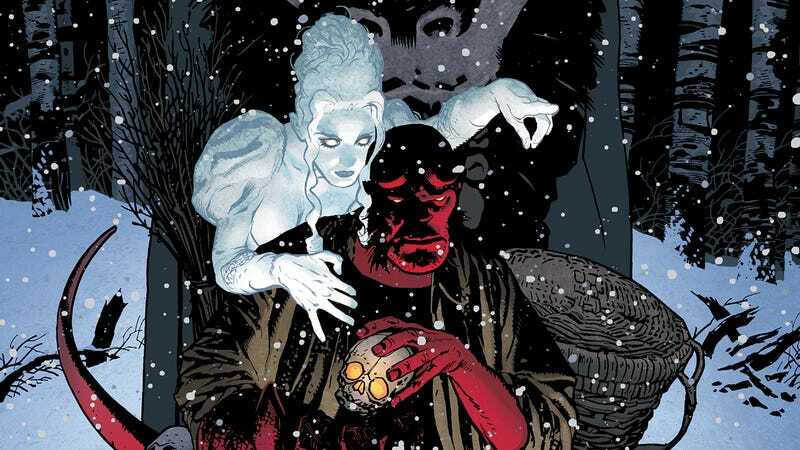 Given his connection to mythology and the supernatural, it’s surprising that Hellboy doesn’t have more Christmas stories. The celebration has pagan roots and an expansive folklore that changes from country to country, providing plenty of material for Mike Mignola to explore with his signature character. As with 1997’s “A Christmas Underground,” next week’s Hellboy: Krampusnacht one-shot pits Hellboy against a demonic being for creepy holiday horror, and artist Adam Hughes joins Mignola for this look at the legend of the Krampus. Adam Hughes channeling Mike Mignola is a beautiful thing, and working within an aesthetic less devoted to realism than his usual style inspires Hughes to bring more contrast to his artwork and use an expressionistic line. This exclusive preview of Hellboy: Krampusnacht shows the blood-red hero in the home of Wilhelm Schulze, an elderly man with a dark secret: He’s actually the Krampus, and after terrorizing human for centuries, he yearns to return home. Hughes’ jagged inks give his typically very smooth art the rough edge associated with Hellboy and his world, and he goes heavy on the shadows while saturating his colors to create extra tension on the page. The final page of this excerpt is a striking shot of the Krampus revealed, and small details early in the scene make this image especially dramatic. Hughes highlights Schulze’s relation to the space, particularly how he’s dwarfed by the large wooden cabinet, so when he shows the Krampus towering over that same cabinet, there’s a greater sense of transformation and physical growth. This is a gorgeous book, and it highlights how artists can evolve by moving out of their comfort zones and tackling projects that push in new directions.